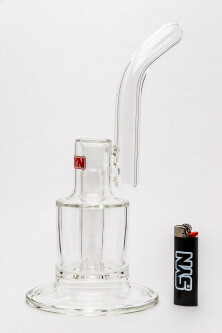 The Chimney bubbler is a versatile design adept at flower or concentrates. A recessed seal is built into the body of the tube, making a streamlined profile with limited exposed appendages. The diffusion level is easily controlled with the amount of water introduced. 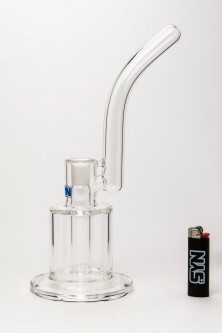 The perc system is a fixed downstem, borne from the recessed ground joint. The fixed downstem operates like a fixed dome, with limited diffusion and very low drag. Adding water will increase percolation and drag but gives more filtration for denser smoke.